Well maintained hedges give your garden or lawn an elegant look. But you need to trim them on a regular basis to make sure that they do not grow wildly thereby destroying the beauty of your garden. Thus, having the gas and electric powered hedge trimmers for cutting grass in your garden is super important. Powered by robust motors and easy to handle, the trimmers make your work very easy. They allow you to cover a large area within a few moments. As a result, it becomes very easy to maintain the hedges. 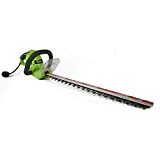 However, you need to be very cautious while buying gas and electric powered hedge trimmer for cutting grass in the garden from the wide array of options available in the market. Does that sound really tire? Well, do not worry. We have prepared the perfect reviews for you to come to a smart decision. 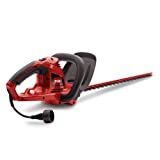 Being part of the battery-powered products from Black+Decker, this cordless hedge trimmer leaves gas powered products in the dust. Firstly, it provides you power, runtime as well as versatility without the hassle of noise and weight of gas run trimmers. However, the 40V max rechargeable Lithium-ion battery is the star of the show. Not only does it delivers long run-time but also consumes high power. You can cut up to 6000-square feet of a hedge with a single charge. 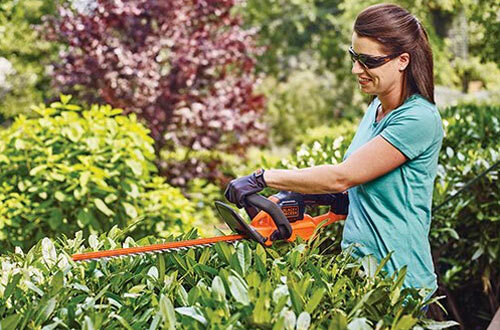 Even it gives you cutting force to shave off twice as many branches with the help of its Power-Drive transmission, not even sparing thick overgrowth. 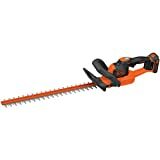 Likewise, its 24-inch dual action blade cleanly cuts branches up to 3/4th of an inch thick. Its blade is made of hardened steel that keeps vibration to a minimum and doesn’t lose its sharpness easily too. Nickel-Cadmium batteries can’t compare since Li-ion batteries hold charge multiple times longer. Energy Star certified charger for fast charging the battery within an hour. Impressive 2400 cutting stroke each minute. Regardless of the speed, one achieves less vibration. Well, it has two power settings, high and low. But you will be blown away even by the power it pumps out at settings turned down too low. 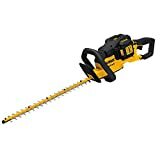 Speed, as well as the performance, of this trimmer from Dewalt, is so exceptional that it can easily rival gas guzzling trimmers. 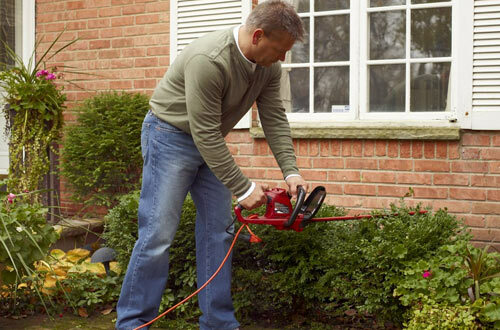 Gas trimmers might take you several cranks or half an hour to get started. But with Dewalt battery operated hedge trimmer, you are good to go with a simple push of a button. Further, switching batteries on this is even easier. You don’t have to deal with pouring the fuel, compromising storage space for it or deal with the frustration of spilling and wastage. The blades on the trimmer ate exceptionally well made. As a matter of fact, you get 22-inch dual action blades that are laser cut for precision. 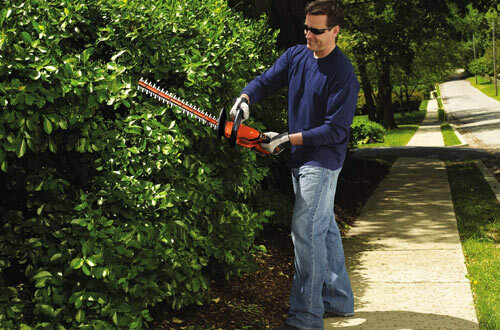 It can chop through any unnecessary overgrown branches and foliage without any issues. 3 years of limited warranty and a year of free service. The hooked-tooth guard blades cut branches up to ¾ inch thick. You get run-time of up to 70 minutes with a single charge. Just with the push of a button, the powerful 4.0 amp motor gives you the power necessary to execute any job done efficiently. The 3200 strokes per minute also let you chop through hedges around your lawn without pouring in extra work and time. It even has an innovative feature that lets you rotate the rear handle to a full 180-degree. To clarify, you can cut at multiple angles at your convenience. Plus, the handle has a lock which is used for retaining the power cord. So when you are in the middle of an important job you don’t have to worry about your extension cable coming loose. With a wrap around front handle and a 22-inch steel blade, you get the freedom to manoeuvre through limbs effortlessly. Cutting capacity of 9/16 inch doesn’t leave any room for shrubs and bushes. Has a transparent shield in front of the handle to keep your hands clear of leaves and twigs. It is an Eco-friendly Reliable System too. Dewalt is one of the industry leaders in manufacturing garden as well as yard tools and products like these are the reason. 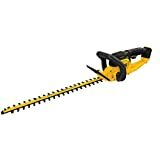 This trimmer is part of Dewalt’s 20V max line-up that allows you to use the same battery hedge trimmer for the whole line-up. Gas powered trimmers might be powerful but you have to deal with emissions and it’s harmful to the environment. But corded tools, on the other hand, have a tangling problem which can be a safety issue while working with power tools. Furthermore, the 5 amp battery pumps enough power for the 22-inch dual action blades to cut through bushes and branches easily. The blade has hooked teeth which increases their efficiency. Moreover, you don’t need to deal with carburettor problems or lose power cords with this powerful cordless trimmer. Lightweight, weighing just 7 and a half pounds. 2800 cutting strokes per minute. Batteries can be swapped easily. 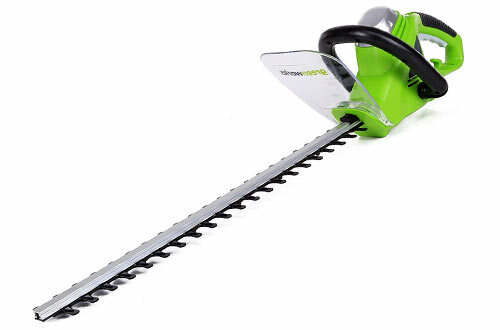 Get the raw power of gas-powered equipment without its troubles with this incredible hedge trimmer from Greenworks. Now, accomplish your yard work done without a hiccup with the sharp and precise 22-inch blade that has a dual action feature. It is powered by a 4 amp electric motor that roars with a button press, unlike problematic and time-consuming gas trimmers. Further, the handle has a nifty little core retainer that eliminates the problem of loose cords, thus reducing unnecessary interruptions as well as saving time. Safety of customers is always a top priority for Greenworks. So it has designed the model with a wrap-around the handle that covers three sides and keeps you safe and secure. Weighs less than 6 pounds. Cuts limbs and branches up to ⅝ inch thick. Rear Handle hedge trimmer has a rotating feature. 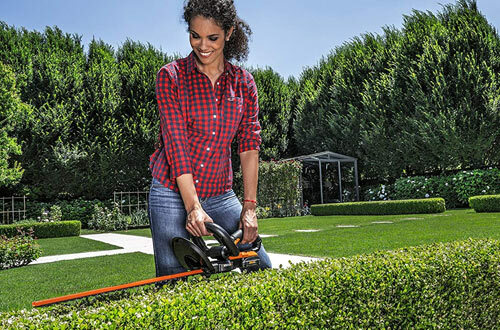 Black+Decker hedge trimmer really redefines the standard of the industry while making their products. This trimmer is one such product that has tons of features aimed to make your life easier. To explain in detail, it’s part of the 20V max line-up which unifies the power source of various yard tools from the brand. Next, the battery can be popped and locked easily with the trimmer. So, with an extra battery pack, you can charge it up while trimming and beautifying your yard. Furthermore, it has a convenient lock feature that keeps the blade running even with one hand. So you can reach tight spaces which previously require shorter manual tools. Moreover, with the 22-inch blade and 3000 spm, you can be confident of its hacking capabilities. Lightweight and compact at just 5.7 pounds. One will certainly experience 40% less fatigue. Has a 2 year warranty period. 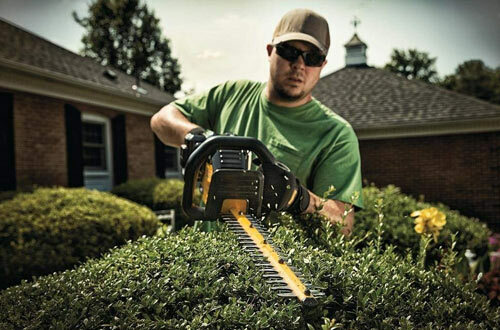 Cuts through ¾ inch branches without any problem. Black+Decker’s newest line of 20V Max Lithium-ion battery yard tools, PowerCommand ™ grants you control like never before. The PowerCut feature that is integrated into this trimmer allows you to power through a tough jam with a simple button push. To emphasize on the battery life, the 20V Max batteries offer you endless versatility. Plus, it will nicely fit in any of the wide range of supported tools from Black+Decker and can save you a lot of money in the long run. 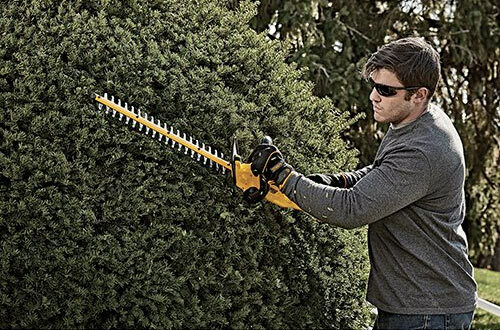 Now you can chop through tough ¾ inch branches with the 22-inch blade that is both agile and efficient. Cut through 3000-square feet of hedge surely with each charge. Ergonomic as well as the intelligent design on handles and grip. Vibration and noise are far lower than competitor products. With this hedge trimmer Garcare, it has in fact perfectly blended affordability and performance. 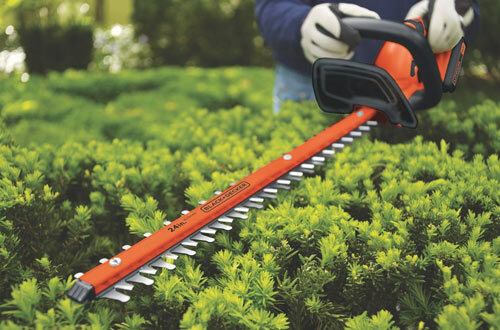 Top quality materials, as well as revolutionary design, make this hedge trimmer one of the best in the market. Its dual-action plus dual-edge steel blade is 24-inch long and coated with titanium. So, your blade is both sharper and more resistant towards corrosion, thus extending its longevity. Moreover, it cut at various angles with the convenient rear handle that supports 180-degree rotation. In particular, the 4.8 amp raw power gives you the necessary strength to hack through tough and stubborn bushes. Chiefly, it has a dual handed operation system that prevents you from accidentally starting the tool. This feature is placed by the company to keep you and your loved ones away from accidents. Cutting capacity of ¾ inch. Large hand guard keeps you away from the sharp blade. Wrapped with a rubber grip for added protection. 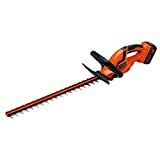 Weighing at only 6 pounds makes this beast of an electric hedge trimmer and even one of the lightest power tools for your yard. Experience raw power like never before with the 20 V battery that can power a lot of other tools from Worx. So instead of using multiple batteries, you can save a lot of money for other investments. The blade has an aluminium cover which protects it from rust and other corrosion while making clean up easier. Further, the soft grip which is over-moulded renders comfort and also offer a firm grip. Another key point is its dual action blades will give you cleaner cuts and lesser vibrations. D-Grip handle makes cutting easy from numerous angles. An ergonomic as well as portable design. Cuts twigs up to 9/16 inch thick. Yard jobs are no longer time consuming with the Toro trimmer. The corded design allows you almost unlimited runtime that can neither be provided by gas or battery powered tools. 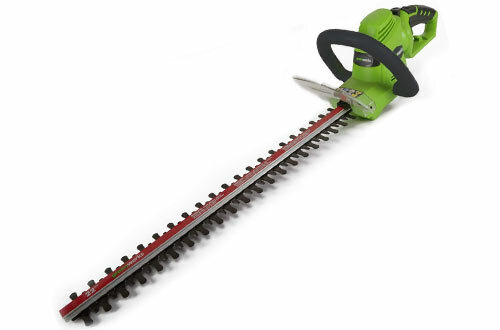 4 amp motor provides adequate power for the 22 inch-blade to work and trim your garden neatly. Along with the dual-action cutting, you get blades that have hardened steel construction. With a doubt, it is faster and comparatively more efficient because of the 4-amp power. Even if it comes with cord, the corded lock mechanism will eliminate the hassles of hangings cords. Handles have a comfortable grip to reduce stress on hands. A limited warranty period of 2 years. 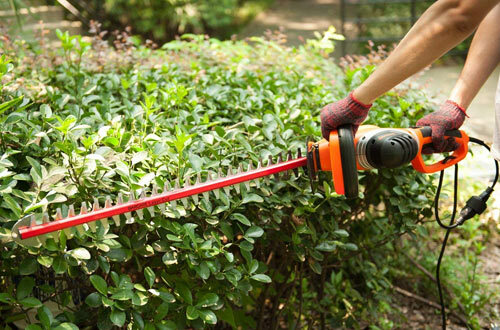 Keep your garden, lawn, nursery etc clean and in shape by buying a hedge trimmer that is best in all the terms.